A teenager wearing earbuds while texting friends is a common sight in the United States. A 2010 Kaiser Family Foundation study found that the amount of time that young people ages 8 to 18 reported consuming media — more than 10 hours a day — has soared while the size of the devices and screens they use has shrunk. Much of this time is spent multitasking, such as texting while watching TV. To what extent does being “plugged in” negatively affect a young person’s social, emotional and intellectual development? Some developmental psychologists have linked multitasking behaviors to the degradation of social and cognitive skills; others have lauded digital media as a relatively safe space where online behaviors mirror an individual’s offline development. 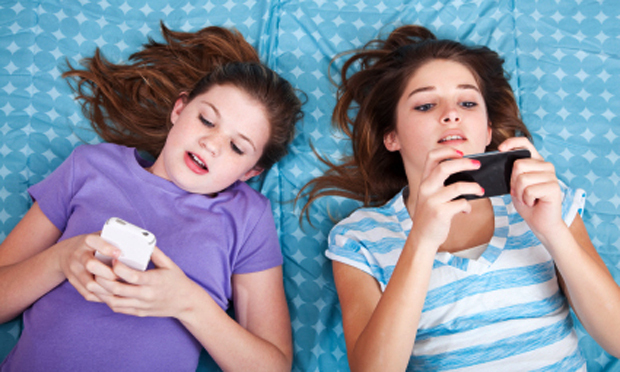 A 2012 study from Stanford University published in Development Psychology, ”Media Use, Face-to-Face Communication, Media Multitasking and Social Well-being Among 8-to-12-Year-Old Girls,” examined how digital media consumption and multitasking may impact social and cognitive development of ’tween girls. Media use included “video, video games, music listening … e-mailing/posting on social media sites, texting/instant messaging, and talking on phones/video chatting.” Researchers used data collected from nearly 3,5000 respondents to an online survey sponsored by Discovery Girls magazine in the summer of 2010. Participants reported approximately seven hours of media use and two hours of face-to-face interactions per day, and they multitasked with an average of 2.4 media items. These levels are significantly lower than those previously reported and are the result of the exclusion of boys and older youth. Citation: Pea, Roy; Nass, Clifford; et al. ”Media Use, Face-to-Face Communication, Media Multitasking and Social Well-being Among 8-to-12-Year-Old Girls,” Developmental Psychology, March 2012, Vol. 48, Issue 2, 327-336. doi: 10.1037/a0027030.